On Saturday it was my daughter’s 2nd birthday, we had a quiet day and my Mum and Dad came round to visit and gave her a baby doll. 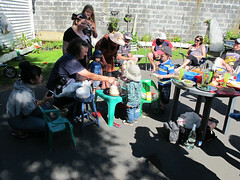 Sunday we had a party out the back in the sun with friends and family and her wee playmate and cousins. And a rainbow cake made by my genius colleague Katie. Monday – back to work. The exciting news late of a new nephew: my brother and his wife had a baby on Monday night, he delivered the baby in the carpark of the hospital. On Tuesday, I got up and showered and dressed for work. Realised I was feeling a nasty cold or flu ache, so decided to stay home. The whanau piled into a car and went to go shopping and have a drive to Sumner or Lyttelton. I changed out of work clothes into velour trackies and crappy old maternity bra and put my glasses on. Started to cook some spuds for lunch when the earthquake came. The noise was inutterably loud and forceful. Stuff flew at me from the cupboards, and the walls. I stood in the kitchen doorframe. I said my prayers aloud – this it it – the Our Father, the Hail Mary, the Glory be – all compressed into a superfast urgent plea. The fridge came down beside me. I had to get out of the house, all around me it was divesting itself of substance, breaking into constituent parts that didn’t rain down on me, but came at me on a 90 degree angle. I had tunnel vision – myself, the door, the fastest way to it. Then I stood in the doorway, horrified, calling out to my neighbour in the front flat beside ours. She was home, and had an air of calm and decision, even though she couldn’t get out as her door was stuck closed. She smashed a window, and got out with her laptop. Where was everybody? How was everybody? And especially my baby, is my baby ok, every atom of me begged to know if she was ok. The most awful sinking hole of pain. My neighbour calmed me down and tried to get a call through. 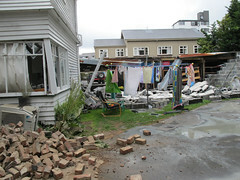 Our other neighbour came home, she was wonderful and by the two using their phones I found out my baby and my man were ok. All of the neighbours on the street came out and we talked, noted each other’s damage and we saw people coming down our street from the CBD, trying to make their way out of town and the tragedy. Somewhere in here was a wonderful moment when I saw Mum and Dad come down the street. We grabbed a few clothes off the washing line, luckily the birthday girl had got some new clothes that I had washed. Undies for him. Floral leggings for me. There were a pair of old sneakers on the doorstep I grabbed, so had some footwear at least. Helpful with all the broken glass. My guy rescued a few things from the house – baby stuff, a laptop and a phone. We went to the burbs to stay with family, all sleeping in one bed, staying close and tight.